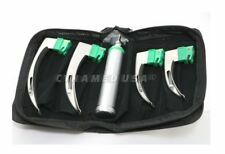 PRODUCT DETAIL : GERMAN LARYNGOSCOPE SET 12PCS INTUBATION BLADES 2 HANDLE FIBER-OPTIC KIT. 1 LARYNGOSCOPE INTUBATION BLADE MILLER #00. 1 LARYNGOSCOPE INTUBATION BLADE MILLER #01. 1 LARYNGOSCOPE INTUBATION BLADE MILLER #02. FIBER OPTIC LARYNGOSCOPE BLADE MAC # 0 1. FIBER OPTIC LARYNGOSCOPE BLADE MAC # 1 1. FIBER OPTIC LARYNGOSCOPE BLADE MAC # 2 1. FIBER OPTIC LARYNGOSCOPE BLADE MAC # 3 1. Rusch 5-Pc Laryngoscope Set Mac / Miller 3 & 4 Blades with Bulbs, plus 'D' Handle with Batteries. Sigma Asset Consultants, LLC. EVERYTHING WORKS, BULB IS FULLY TESTED! For sale are disposable Laryngoscope Mac Miller Set of 4 BLADES & HANDLES. Laryngoscope Mac 3 & 4 Miller 2 & 3 Set of 4 BLADES with HANDLE. x1 MAC 3 with Handle. x1 MAC 4 with Handle. x1 MILLER 2 with Handle. 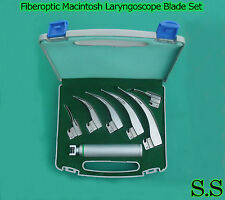 DETAILS - FIBER OPTIC Laryngoscope Mac Set of 5 BLADE & HANDLES EMT Anesthesia. FIBER OPTIC LARYNGOSCOPE BLADE MAC # 00. FIBER OPTIC LARYNGOSCOPE BLADE MAC # 1. FIBER OPTIC LARYNGOSCOPE BLADE MAC # 2. 1 FIBEROPTIC MACINTOSH LARYNGOSCOPE BLADE #0. 1 FIBER OPTIC MACINTOSH LARYNGOSCOPE BLADE #2. 1 FIBEROPTIC MACINTOSH LARYNGOSCOPE BLADE #1. 1 FIBER OPTIC MACINTOSH LARYNGOSCOPE BLADE #3. 1 FIBER OPTIC MACINTOSH LARYNGOSCOPE BLADE #4. ORIGNAL FIBER OPTIC MILLER LARYNGOSCOPE SET WITH 6 BLADES 1 HANDLES AND A BEAUTIFUL CASE. FIBER OPTIC LARYNGOSCOPE BLADE MILLER # 000 1. FIBER OPTIC LARYNGOSCOPE BLADE MILLER # 00 1. 1 MACINTOSH LARYNGOSCOPE BLADE #0 WITH BULB. 1 MACINTOSH LARYNGOSCOPE BLADE #1 WITH BULB. 1 MACINTOSH LARYNGOSCOPE BLADE #2 WITH BULB. 1 MACINTOSH LARYNGOSCOPE BLADE #3 WITH BULB. 1 MACINTOSH LARYNGOSCOPE BLADE #4 WITH BULB. CHOOSE THE DEAL AND COMPARE PRICES. CARE FOR YOUR HEALTH. "The sale of this item may be subject to regulation by the U.S. Food and Drug Administration and state and local regulatory agencies. This Set Included. 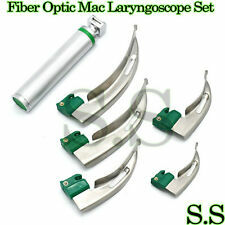 Macintosh Fiber Optic Laryngoscope Set. Blade Size 00 - 0 and 1 Handle C.
One Piece Macintosh Blade #2. One Piece Macintosh Blade #3. One Piece Macintosh Blade #4. "The sale of this item may be subject to regulation by the U.S. Food and Drug Administration and state and local regulatory agencies. 1 EA Laryngoscope Miller Blade, Size 0. 1 EA Laryngoscope Miller Blade, Size 1. 1 EA Laryngoscope Miller Blade, Size 2. 1 EA Laryngoscope Small handle. Excellent Quality Stainless Steel. Set Detail. 1 Small Laryngoscope Handle (Take 2 "C" Batteries, Not Included). 10 Blades (Macintosh #1 #2 #3 #4 & #5) ( Miller #1 #2 #3 #4 & #5 ). Choose The Deal and Compare Prices. 12 Pieces Set. Credit Card Over The Phone. 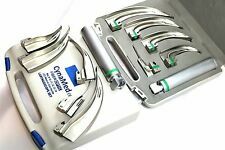 McIntosh Laryngoscope Set,1 Handle & 4 Blades with LED Bright Light. 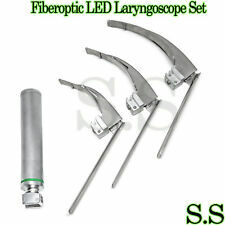 Fiber Optic McIntosh Laryngoscope Set,1 Handle & 4 Blades with LED Bright Light. Fiber Optic McIntosh Laryngoscope Set contains 4 Blades with LED bright lights. Mac Miller Laryngoscope Set. Always Best Quality! Nine Blades Two Handles. OUR PRODUCT RANGE. Our production process has attained ISO 9001:2008, ISO 13485:2003 certification, cGMP compliant and CE certification. The Macintosh Laryngoscope Blade: The Macintosh is the predominate model of the curved blade types. Also available is a die-stamped or one-piece construction blade with a slightly expanded flange. The Miller Laryngoscope Blade: The most popular of the straight types. 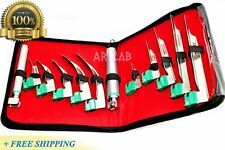 KING VISION #3 KVL03C LARYNGOSCOPE BOX OF 10 New Sealed Channeled Blades. Direct connect with camera and light source all in the blade! Hard to find! NEW MILLER LARYNGOSCOPE SET OF 3 PCS BLADE 1 HANDEL LS-3001. "The sale of this item may be subject to regulation by the U.S. Food and Drug Administration and state and local regulatory agencies. 01 PCS # 2. 5 Mac Blades # 0,1,2,3,4. 5 Miller Blades # 0,1,2,3,4. CHOOSE THE DEAL AND COMPARE PRICES. This Set Included CARE FOR YOUR HEALTH. 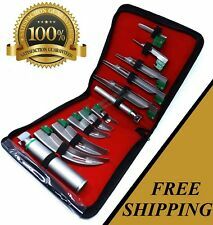 LARYNGOSCOPE MACINTOSH MAC MILLER INTUBATION SET OF 10 BLADES AND TWO HANDLES EMT ANESTHESIA. 1 MACINTOSH LARYNGOSCOPE BLADE #0 WITH BULB. 1 MACINTOSH LARYNGOSCOPE BLADE #1 WITH BULB. 1 MACINTOSH LARYNGOSCOPE BLADE #2 WITH BULB. Product Conforms to ISO 9001, CE-Quality Mark, ISO 13485, FDA and other Quality Standards. FIBER OPTIC MAC LARYNGOSCOPE SET WITH 5 BLADES 1 HANDLES AND A BEAUTIFUL CASE. FIBER OPTIC LARYNGOSCOPE BLADE MILLER # 0 1. FIBER OPTIC LARYNGOSCOPE BLADE MILLER # 1 1. Glass Macintosh Blade # 1, 2, 3 & 4. The Bright & Whitest LED illumination for a Perfect View. Blades are Made of Non Magnetic Surgical Grade Stainless Steel. Satin Finish (Actual Picture Of The Product). NEW MILLER LARYNGOSCOPE SET OF 3 PCS BLADE 1 HANDEL. CHOOSE THE DEAL AND COMPARE PRICES. Credit Cards Over The Phone. "The sale of this item may be subject to regulation by the U.S. Food and Drug Administration and state and local regulatory agencies. Mac Size 4. Disposable single patient use. Fiberoptic Macintosh Laryngoscope Set. It is easy for us to fix any problem you may have with our products or services. We have multiple units available in similar conditions - all are fully functional - no etchings or other personalizations, no major dings - just average signs of wear and use. Obviously, units should be properly cleaned prior to use. Never used, like new condition. Welch Allyn Model 60813 Laryngoscope handle. 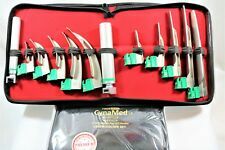 Listing is for one (1x) King Vision Video Laryngoscope in perfect working condition, as well as ten (10x) #3 KVL03 blades; 9 are unopened, sterile and one has been opened to test the item with. Item functions perfectly and is in excellent cosmetic condition. Screen has no scratches and is bright. Item powers on immediately with 3x AAA batteries and when used with an opened sample blade, illuminated the blade LED and showed high definition video. I’m unable to test the item beyond this. Item being sold AS-IS, NO REFUNDS. Please feel free to ask any and all questions prior to bidding. Thank you! Mac And Miller Laryngoscope Fiberoptic. 5 Mac Blades # 0,1,2,3,4. 5 Miller Blades # 0,1,2,3,4. 1 Small Fiberoptic Handle. • 100% Guaranty. New Mcgrath MAC video laryngoscopes. Each laryngoscope is brand new, never used and 2018 lot. Each laryngoscope comes with laryngoscope/ screen and new battery. 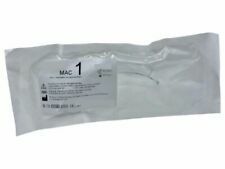 Included in lot are 5 new disposable Mac3 blades. 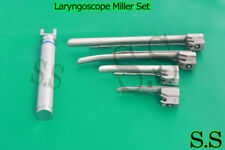 Over 40 laryngoscopes sold so bid with confidence. One year warranty from manufacturer. Price is firm. Returns only accepted on unused defective product. If you use the scope it can be fixed with warranty, but not returned. Thanks and God bless you. I will be out of town April 12-19 and will not be able to ship items during this time. A laryngoscope spatula of a very special kind. "Fully functional" also makes this 3-piece MacIntosh spatula his service to every bottle. Bottle opener "Laryngoscope" Novelty Gift Item. BOTTLE ARE NOT INCLUDED. 1 Fiberoptic Laryngoscope Handle Small. It is easy for us to fix any problem you may have with our products or services. Flexi Tip Laryngoscope Set McCoy Type. MCCOY FLEX. Satin Finish (Actual Picture Of The Product). Premium Grade Stainless Steel. CURAPLEX Laryngoscope Miller Size #2 Blades w/Bulbs Standard EX COND! A laryngoscope is a rigid or flexible type of endoscope placed in a patient's mouth to view the throat and voice box (larynx). It can have an LED light source and magnifier attached to it, or it can be a disposable design. Doctors use scopes for diagnostic purposes or to perform certain surgical procedures. How is a laryngoscopy done? A laryngoscopy is a relatively painless procedure done in a doctor's office. During the procedure, vocal cords are examined in detail, often with real-time video produced using fiber-optic illumination with an LED light and displayed on a monitor. There are three types of laryngoscopies that can be performed. Direct laryngoscopy: Performed under general anesthesia while the individual is lying down, a direct laryngoscopy allows the vocal cords to be viewed directly. Indirect laryngoscopy: With an indirect laryngoscopy, individuals are seated in a chair while their vocal cords are viewed. Fiber-optic laryngoscopy: A fiber-optic laryngoscope with an LED light and a magnifier is used with this type of laryngoscopy. The flexible scope with the LED light is inserted through the nostril or mouth. What is a laryngoscope blade used for? Laryngoscope blades attach to the handle and make an electrical connection when the scope is extended. Laryngoscope blades are used for the examination of the inside of the larynx. They are also used for placement of an endotracheal tube in the patient's throat. Straight laryngoscope blades are the ones used most often. How do you clean a laryngoscope? Rinse it under cool running tap water immediately after use. Use high-level disinfection or sterilization. Rinse all hard to reach areas. What are some of the different types of laryngoscope blades? MacIntosh: This is the most common type. It attaches to the handle at 90 degrees. Kessel: Similar to the Macintosh, this one attaches to the handle at 110 degrees. McCoy: Manipulated by a thumb-controlled handle, this one has a a moveable distal tip segment. Magill: This straight blade has a cross-section that's U-shaped.